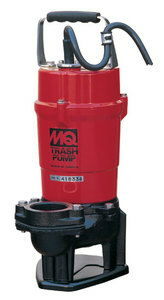 ELECTRIC SUBMERSIBLE TRASH PUMP FOR HEAVILY DEBRIS LADEN WATER WITH 2" DISCHARGE PORT WILL HANDLE SOLIDS UP TO 1". A VORTEX ACTION DISCHARGES SOLIDS AWAY FROM THE CAST IRON IMPELLER TO PREVENT CLOGGING. * Please call us for any questions on our pump 2 inch trash 110v submersible rentals in Portland OR, Gresham OR, Milwaukee OR, and surrounding metro area.